Lily Sender scored three goals Friday to help UNLV clinch the Mountain West women’s soccer regular-season title with a 4-2 win over UNR in Reno. Sender’s goals, the first three of the match, gave her 14 on the season. 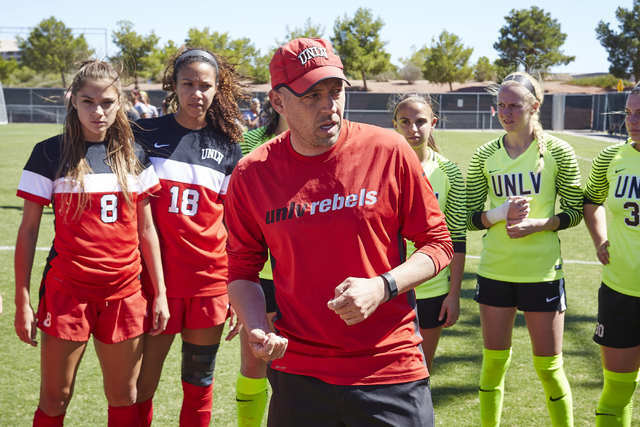 Susie Bernal also scored for the Rebels (15-3-2, 8-1-2), who won their first league title since 2007 and clinched the top seed in next week’s Mountain West tournament. Hannah Miller scored in the 74th minute and Amelia Jacobs in the 89th for the Wolf Pack (5-13, 2-9), who were outshot 22-17 but held a 13-12 edge in shots on goal. Jordan Sallee had 11 saves for UNLV. At Kuna, Idaho, led by Spencer Moore’s 49th-place finish, UNLV placed 11th in the Mountain West Championships. Moore finished the 6-kilometer race in 22 minutes, 12.5 seconds. Defending national champion New Mexico won its ninth straight league title. Other finishers for the Rebels were Angela Ziff (72nd, 23:06.30), Sara Williams (77th, 23:38.90), Lindy Eskin (81st, 24:31.2), Kennedy Allen (84th, 25:16.60) and Caitlin Amburgey (85th, 25:23.60). The Lobos, ranked seventh in the latest USTFCCCA poll, won with 42 points, led by a 1-2 finish by Alice Wright (20:02.70) and Calli Thackery (20:11.30). Air Force finished second with 53 points and Boise State third with 86. Next came Colorado State (103), Wyoming (123), Utah State (148), UNR (193), San Jose State (224), San Diego State (261), Fresno State (276) and UNLV (309).